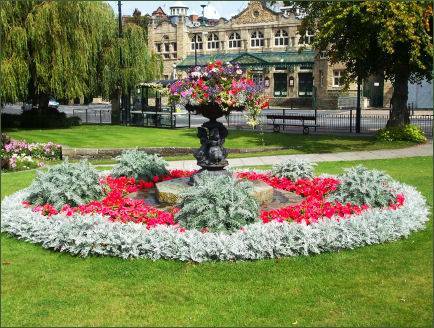 The stylish Yorkshire spa town of Harrogate, England's floral town, became known as 'The English Spa' in the Georgian period. The town grew in the sixteenth century from two small villages, High Harrogate and Low Harrogate, when a natural spring at Tewitt Well was discovered to be rich in minerals. 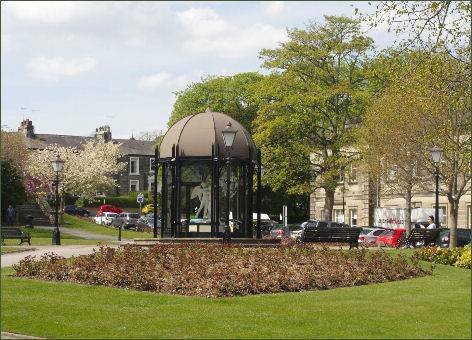 By the following century it had become fashionable to visit Harrogate to 'take the waters' Its spa water contains iron, sulphur and salt, its 'chalybeate' waters and became a popular health treatment. 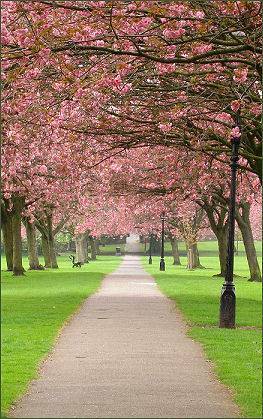 The name Harrogate is first recorded in the fourteenth century as Harwegate. It derives from Old Norse horgr meaning 'a heap of stones, cairn' and gata 'street', presumably meaning 'road to the cairn'. The Royal Pump Room, located on Crown Place, stands over the main mineral spring, Europe's strongest sulphur well, it was constructed by Isaac Shutt in 1842, an annexe was added in 1913 which is now used as a museum featuring the story of Harrogate as a spa and a centre for rest and recuperation. The museum contains some facinating exhibits, including a noneteenth century Bath chair and a selection of period costumes. The spa's most famous visitor was Tsarina Alexandra of Russia, a granddaughter of Queen Victoria, who came to Harrogate in 1911. The Montpelier district has a number of tourist attractions, famous for its cafés and restaurants, it also boasts a number of antique shops and is surrounded by beautiful gardens and flower beds. 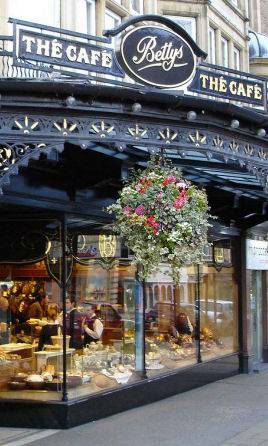 The town is renowned for its well developed café culture, the famous Betty's Tearooms (right) were first opened in 1919 by Frederick Belmont, who sold Swiss confectionery to visitors. 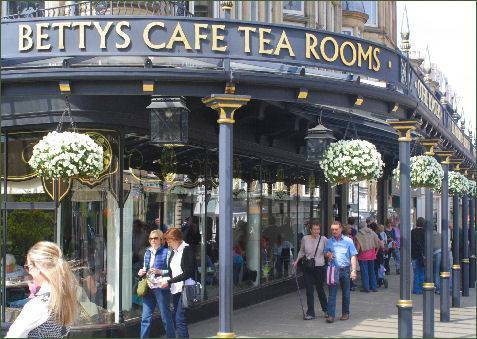 The tearooms are owned by Bettys and Taylors of Harrogate, the same company that makes Yorkshire Tea and still offers a varied menu of cakes, chocolates, and breads, and over 50 different types of tea and coffee. There are many fine examples of architecture about the town. The only Grade I listed building in Harrogate is St Wilfrid's Church, situated on Duchy Road, which was designed by the architect Temple Lushington Moore and is often considered to be his masterpiece.The Royal Hall Theatre in Oxford Street was designed by Frank Matcham and is an important national heritage building. Since its multi-million pound restoration in 2008, the Royal Hall has become the number one venue in Harrogate for live entertainment and high-profile events. The Royal Baths of Harrogate, facing the Crescent Gardens, which opened in 1897, is now a Turkish Baths and Health Spa experience. 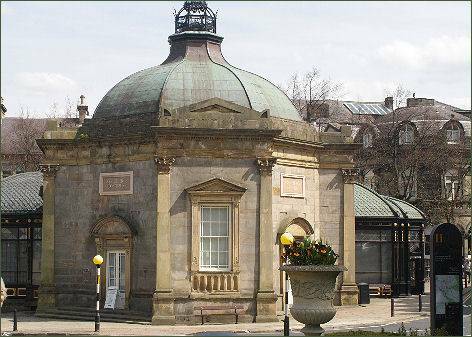 Situated on Crescent Road, the Bath House itself is an impressive domed building. The Grand Pump Room underwent a £1.5 million restoration and now serves as a very grand Chinese restaurant. 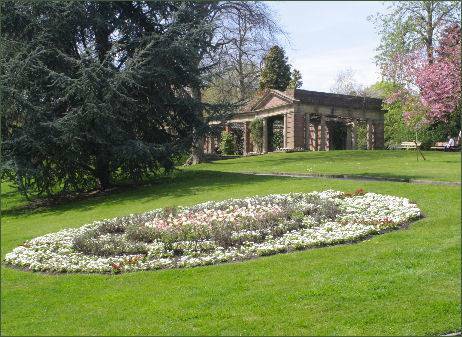 The Pump Room of the Royal Baths was originally used to dispense the famous mineral waters. The Mercer Art Gallery next to the Royal Pump Room, is home to Harrogate's art collection which features 2,000 works of art, mainly dating from the nineteenth and twentieth centuries and includes works by William Powell Frith, Atkinson Grimshaw, Sir Edward Burne-Jones, Dame Laura Knight, Alan Davie among others. The town is also famous for its shopping, the main shopping centre is situated just across the street from the main railway station and features designer labels shps and independent retailers, as well as the usual high street names. The Victoria Shopping Centre is home to a multitude of fashion outlets, as well as various cafes. 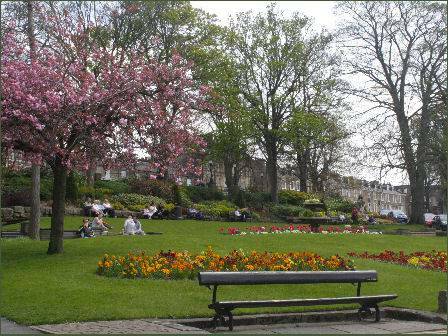 Many people who visit Harrogate enjoy the well kept gardens and parks of the town, The beautiful Grade II listed Valley Gardens, (pictured right) situated in Low Harrogate, is the town's main park, it cover 17 acres and contains many mineral springs. Low Valley is believed to possess more mineral springs than any other place on earth. The gardens has an ice cream parlour, children's play area with outdoor paddling pool, a skate park. There are also facilities for a wide variety of outdoor games such as tennis courts, pitch & putt golf course, crazy golf, boating pool, and a paddling pool. Band concerts take place on Sunday afternoons throughout the summer months. 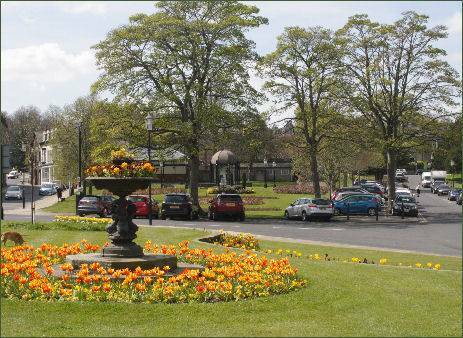 The Stray, (pictured above left) an area of open parkland in the centre of Harrogate, it was laid out in 1778 as a means to link the major mineral springs by a green belt. Crescent Gardens is another small garden area, at the centre of the town's tourist attractions, the Pump Room, Royal Baths, and the Town Hall. St Wilfrid's Church, which dominates the Harrogate skyline, is a Grade I listed building and was designed by the architect Temple Lushington Moore and is his most famous work. 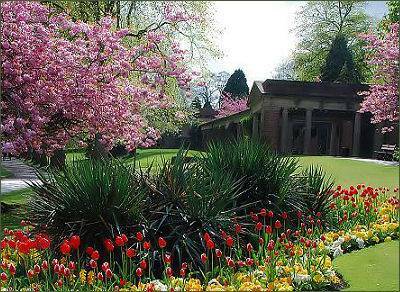 RHS Harlow Carr Gardens, on the western edge of town, is a stunning 58 acre garden is set in a valley and contains a woodland garden, a herbaceous garden, rock, bog and alpine gardens, wildflower and bird hide, Gardens through Time and the Queen Mother's Lake. The gardens contain rare species including Davidia, Oxydendrum and Stewartia. The woodland and arboretum boast excellent displays of Rhododendrons and Camellias. A tenth century Viking hoard was discovered near Harrogate In 2007 by two metal detectorists. Known as the Harrogate hoard, it contains almost 700 coins and other items from as far away as Afghanistan and has been described as the most important find of its type in Britain for 150 years.